Now, I’ve made my fair share of pies for Let’s Lunch before. Two years ago, when we did pie as a summer lunch topic, I dreamt up a Japanese curry pie that — if you don’t mind me saying — was out of this world. Just this summer, when we attempted “Too Hot to Cook” dishes, I whipped up a chilled key lime-mango pie that pretty much disappeared instantly in this household. For this month though, savory pies were on my mind. I have long adored British pork pies and lamb curry pies — though I’ve never had the guts to actually attempt one. And recently, I’ve been a little obsessed with Canadian tortières, a holiday pie (for Christmas or new year’s) packed with dice veal, beef or wild game. With a looming deadline for my book revisions however, there was no time for anything quite so ambitious. 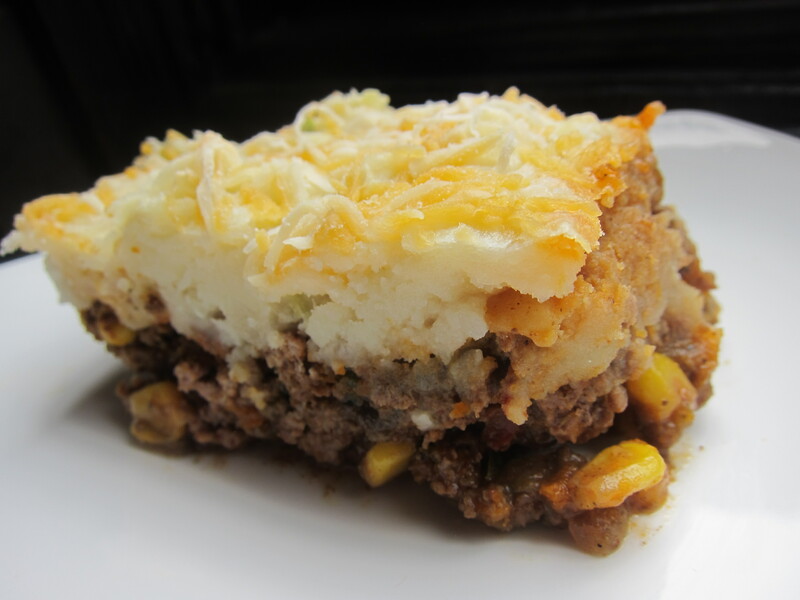 Instead, I took a stab at a pie combination that I’ve imagined might be tasty: Mexican Cottage Pie. Now, I adore British cottage pie — always have, since my girlhood in Singapore. And I adore Mexican flavors. How about combining the two in a dish? 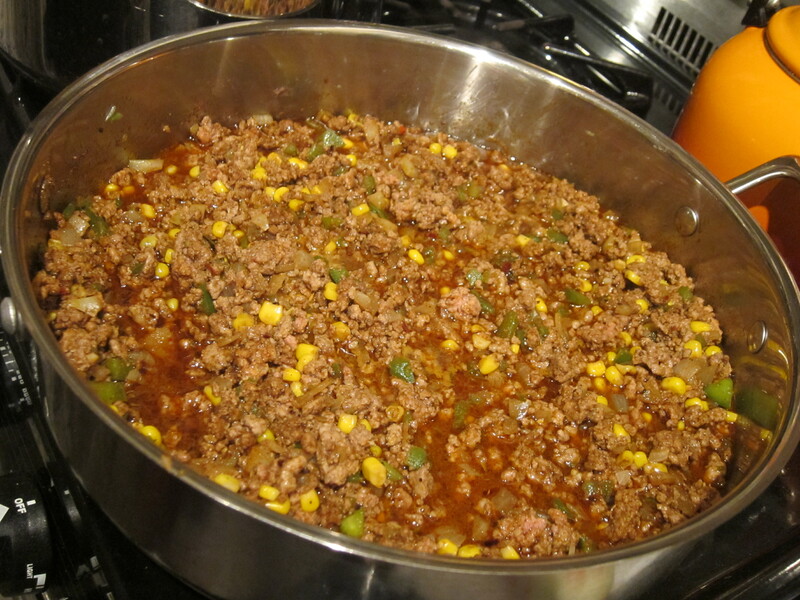 First, I started with the filling — sauteing ground beef, garlic, green bell peppers, corn, onion and home-made taco seasonings in a pan before adding some beef broth and cooking all that together. 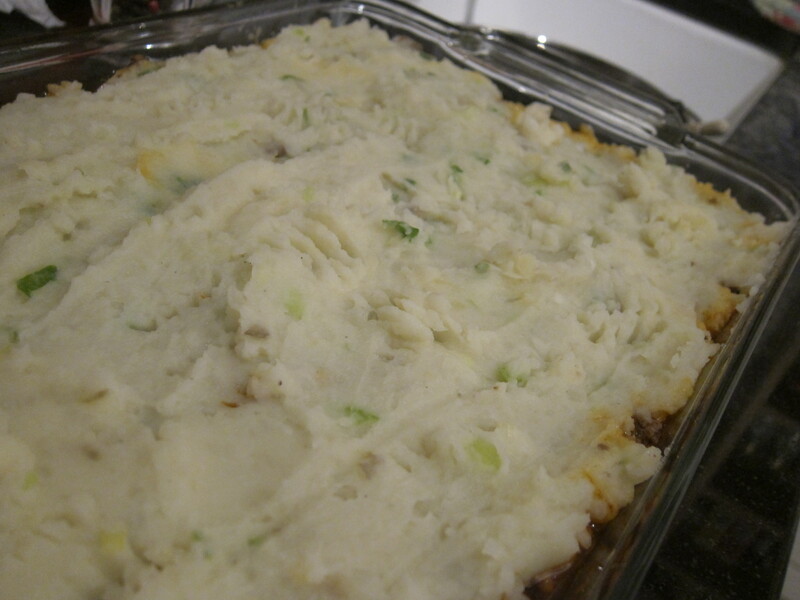 Next, I lay that in a casserole dish and topped it with buttery mash with minced scallions mixed in for some extra zing. Then I topped that with shredded Mexican-style cheese. Into the oven that went, and when it emerged, it was a steamy melty mess of potatoes and cheese with bubbling Mexican goodness beneath. It smelled divine. And each bite of heavily spiced ground beef paired with creamy mash, topped with a little bit of crunch from the crusty shredded cheese was irresistible. Sous chef and I each had two massive helpings before realizing we’d eaten our way through almost half the casserole pan in just one sitting. So I’d say the experiment was a success. My little recipe’s below, if you’d like to try it out at home. In the meantime, as always, buon appetito! Don’t forget to check out other Let’s Lunchers’ pies below! And if you’d like to join Let’s Lunch, go to Twitter and post a message with the hashtag #Letslunch — or, post a comment below. ** Note, if you want to lower the amount of butter in this dish, use 4 TB vegetable oil or 2 TB oil and 2 TB butter to cook the veggies and beef in instead. Preheat oven to 400 degrees. Cut potatoes into quarters or large chunks, place in a pot, add 1/2 tsp salt and fill up with water so there’s about an inch of water above the potatoes. Bring to a boil then let that simmer for 15 to 20 minutes, until potatoes are tender and you can put a fork through them. Drain potatoes and return to the pot, add four TB butter and milk, then mash it all up until smooth. Add salt to taste then mix in minced scallions and set aside. Add salt and pepper to taste then set aside. If using frozen corn, thaw the corn and set aside. Heat four TB butter (or two TB butter and two TB oil) in a large pan then add minced garlic, sauteing until fragrant, about 30 seconds to a minute. Then add onion and green pepper, sauteing until they’ve softened. Add beef, breaking it up and mixing it well. Just before it’s fully cooked, add taco seasoning and mix well. When beef is almost cooked, add corn and beef broth and mix well. Let it cook, uncovered, simmering on low heat for 10 minutes. Make sure the liquid has cooked down a little — you don’t want the filling to be too runny. 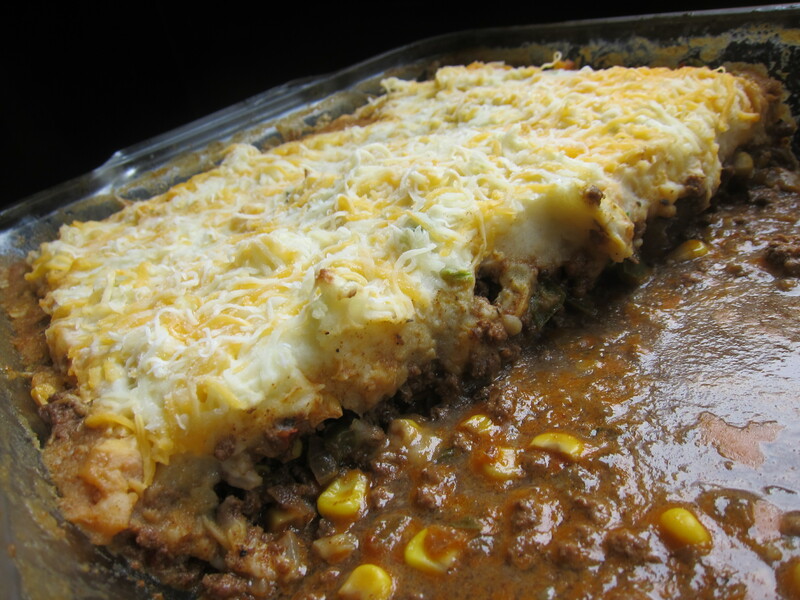 Remove beef mixture from pan and it into a three-quart casserole dish, distributing it evenly. 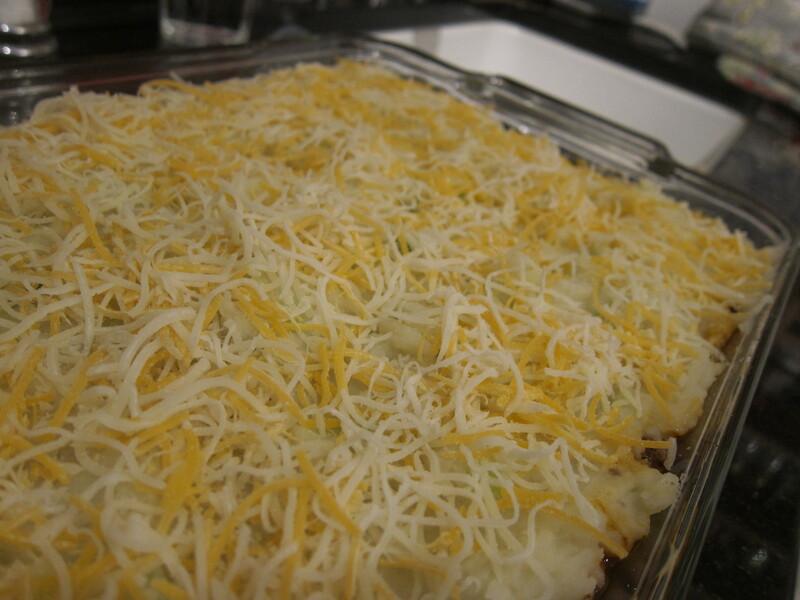 Layer the mashed potatoes on top evenly then use a fork to rough up the top a little so it’s not entirely smooth. 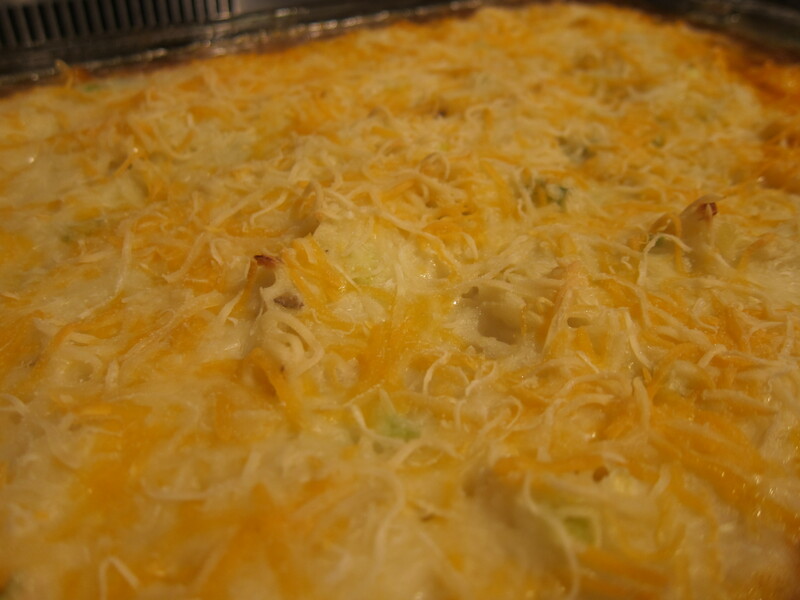 Sprinkle cheese on top and bake 20 to 25 minutes, until it’s bubbling and crusty. Remove from oven, let it rest for a bit, then serve with a side salad.